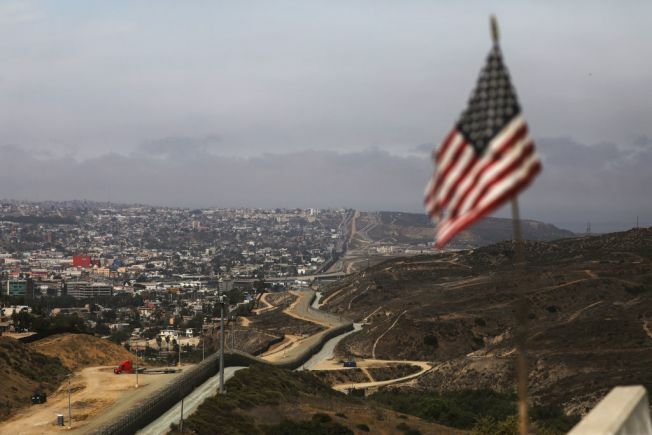 An American flag flies along a section of the U.S.-Mexico border, with the Mexican city of Tijuana in the background (L) in San Diego, Calif.
Two San Diegans were killed at point-blank range in Tijuana, Mexico, over the weekend, their school's superintendent confirmed to NBC 7. Seventeen-year-old Christopher Alexis Gomez, a high school senior at O'Farrell Charter School in Encanto, and Juan Suarez Ojeda, a graduate from Ingenuity Charter School in Skyline, were shot in the head Sunday near a housing complex in Tijuana. A third man was also killed in the attack, but officials have not released his name. Superintendent Johnathan Dean confirmed the deaths and said the schools created a GoFundMe page to assist their families with funeral arrangements. Tijuana police confirmed three men were found dead with apparent gunshot wounds at 5:50 a.m. on Sunday but did not provide any details about their investigation or if any suspects were identified. Both Ojeda and Gomez had attended the charter schools since they were in middle school. Dean said this week has been a trying time for their schools. Gomez was on his school's football team and had relatives that attend the school with him, Dean said. Dean described him as “Real lighthearted, never a discipline problem, just a really good kid." Dean said Ojeda was visiting one of his parents, who lives in Tijuana, when the shooting occurred. He said Ojeda was never in trouble as a student and had frequent conversations with his teachers about planning his future. Dean said Ojeda's mother pushed him to earn his high school diploma, part of the reason he enrolled at Ingenuity. “That’s what’s so tragic. Their lives ended so young," Dean said. Students and friends of the two young men spent Thursday brainstorming ideas for honoring them on campus. A memorial bench and a jersey retirement ceremony for Gomez were suggested. Students also gathered after school and released balloons in their memory. Dean said he has read in news reports that Gomez and Ojeda were tortured before they were shot, but law enforcement on either side of the border have yet to confirm that.